The operation on mailbox “Mailbox” failed because it’s out of the current user’s write scope. 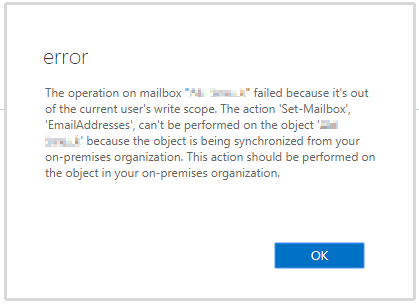 The action ‘Set-Mailbox’, ‘EmailAddresses’, can’t be performed on the object ‘Mailbox’ because the object is being synchronized from your on-premises organization. This action should be performed on the object in your on-premises organization. 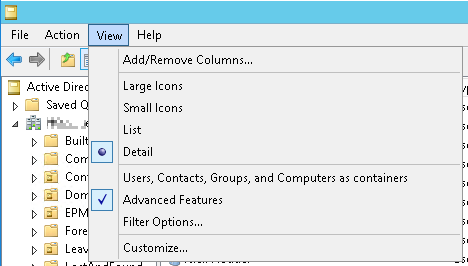 Double click on the user that you want to edit the email addresses for. 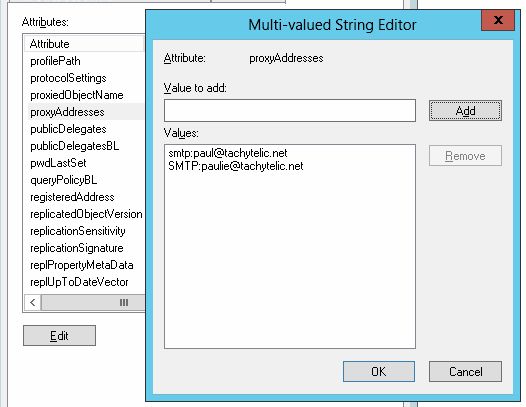 Go to the “Attribute Editor” tab. Go to the “proxyAddresses” attribute and click edit. Edit the email addresses as per your requirements. Note that the primary address (which is the address that the user will send emails from) is in uppercase “SMTP”. It is possible neither of the above methods will work if you have never had Exchange installed locally, as the users will not have these attributes. You can follow the instructions on this page in order to get the attributes enabled for your users. Thank you very much! If we wanted to do this for all users how would the script read? Can you explain a little more about what you would like to achieve?